Well, Schatze had an eventful week. On Sunday, her ear were swollen like pillow, which required a trip to the vet. I think she may have been bit by a wasp since they were in the grass everywhere Saturday. The vet couldn't find anything wrong with her, so after some Benadryl, her ears went back to normal in 48 hours. Tuesday, she uncovered a nest of mice. I have since put rocks over the hole in the ground. She promptly dug them up and moved them. I put them back again and put up a little fence around it. Let's hope that stays. Wednesday, she caught a bird. 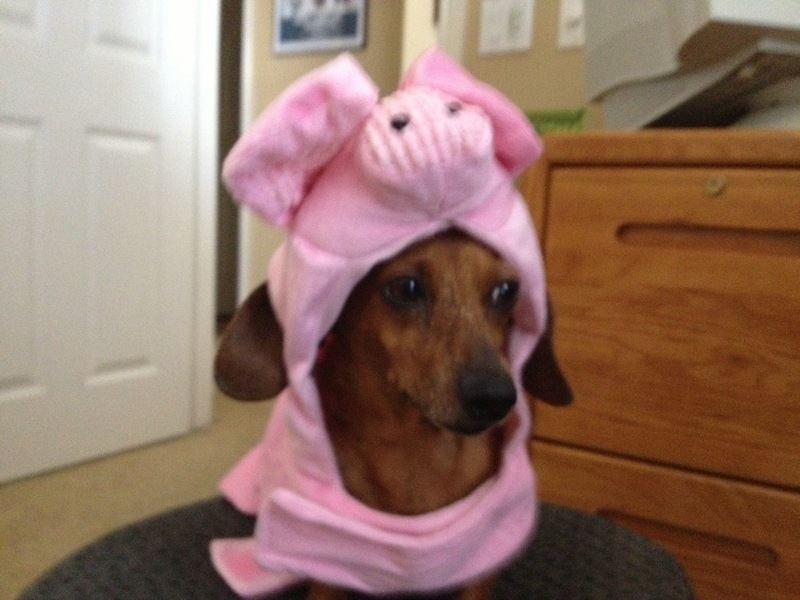 That is why she is wearing the Pig costume. I want to embarrass her. She tried to bring the bird in the house. I think as a gift or peace offering. Um, no, thank you. Please let me have a quiet next week. I think the humiliation is complete! She is one determined dog to move rocks to get at those mice. And really, congrats are in order for her finally catching a bird--that takes cat-like stalking!! Have a good weekend! It wouldn't be so bad but this is the third bird she has caught to far this year. She hides under bushes and then pounces -- just like a, well, not really a cat, more like a snake. Yes, a snake in the grass. Sigh. Oh boy, three! Still amazed with those short legs! The beagle continues to be taunted by various birds and squirrels, always a minute too late!